PLX Devices Multi Gauge DM-6 is the world’s most advanced gauge for automobiles. “One Gauge Does It All.” It is designed to display the parameter of varieties of PLX Sensor Modules. Design – The gauge fits into most aftermarket cups (2-1/16″ or 52mm diameter). Ultra slim design (0.7″ or 18mm) makes it possible to mount almost anywhere you want. Touch Screen – There are 3 touch buttons on the display of the gauge. The left button changes the parameter between the sensors. Using the right button changes the style of the display between Numeric, Graph, and Peak n’ Hold. Pressing and holding the bottom button shows unit label and range. And the combination of these button use takes you into Menu mode for a setup. No conventional buttons are found on PLX Devices Multi Gauge. They are things of past. Set up warnings – Warning feature allows you to set the limit of parameter. The gauge warns you by flashing LEDs when the parameter goes above or below the limit, depending on the setting you have made. It can be monitoring up to 2 sensors’s parameter. 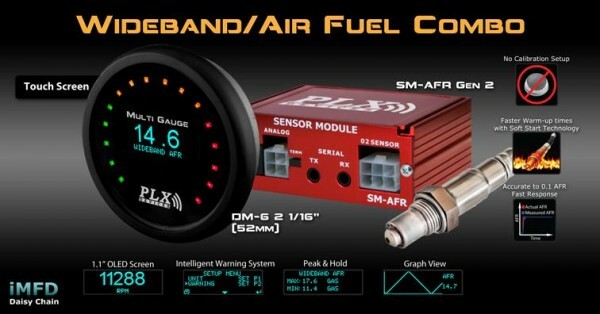 DM-6 & SM-AFR Combo – PLX Devices Multi Gauge DM-6 is also available as a combo kit with SM-AFR (Wideband Air / Fuel Ratio Sensor Module). The purpose of monitoring air fuel ratio is to keep an eye on the condition of an internal combustion engine. Over lean mixture causes to misfire, increase exhaust temperature, damage the catalytic converter, and burn valves. Over rich mixture causes poor fuel economy. And also it is one of the very important parameters in high performance tuning.